The chart below shows that there is no warming occurring in Los Angeles. Yet, one of the foundational arguments for California's AB 32, The Global Warming Solutions Act of 2006 is that temperatures in the state will climb as CO2 increases in our skies. More particularly, the Air Resources Board (ARB) points to warmer night-time temperatures in winter months as somehow insidious and harmful. They also mention heat waves that are longer and hotter, causing great misery and health problems for people, plus more problems for agriculture. Below is a chart from the National Weather Service, part of NOAA, showing some interesting information. The band of pink shows the temperatures above normal, the light green shows the normal temperature range, and the blue band shows the temperatures below normal, all during the 30-year base period of 1971 through 2000. This type of chart is very instructive because the colors and layout show very clearly if the present year's temperatures are hotter or cooler than the average. Although not a part of this discussion, there is a rainfall chart in olive green below the temperature chart. The rainfall for 2009 is a bit behind the average. More comments below the chart. The band of dark blue vertical lines represent the maximum and minimum temperature for each day, or the temperature range. What is instructive is that night-time temperatures, the bottom part of the heavy blue vertical lines, are not warmer than usual, as ARB states they are. If anything, the night-time low temperatures are below normal, because there is precious little of the light green band showing below the dark blue lines. The ARB's insistence that the daily high temperatures are growing greater and longer, with more pronounced heat waves, also is not true from this graph. What we do see is more of the light green band peeking through just above the daily high temperatures, especially during February, June and the first two weeks of August. This is the type of factual evidence that can be brought to bear on repealing climate change laws such as AB 32, or at the minimum, softening their impact before they can do any real harm to citizens of this state and the economy. By the way. 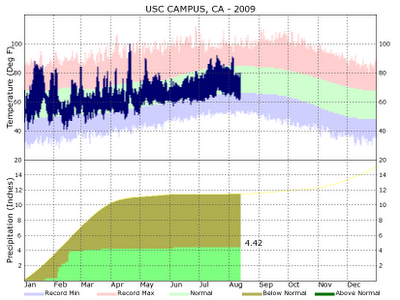 That short-lived temperature spike around April 18, where the temperature spiked to 100 briefly, was a function of a high-pressure system over Southern California that caused the wind to drop to zero that day. Nothing more. Nothing less. Just no wind. Not excess CO2, not a lack of aerosols, not too much coal-fired power plants in China blowing their CO2 across the Pacific Ocean, just a normal weather event where the wind does not blow. Ms. Mary Nichols, Chair of the ARB, I stand ready to explain these and many other things that will show that the entire foundation for AB 32 has no merit.